What are the holidays without good food? Get inspired by the elegant “Eatie Gourmet” who symbolizes the essence of the home cooked holiday meal. “Eatie” is sure to tantalize your senses with her subtle cinnamon aroma and sparkling utensils. 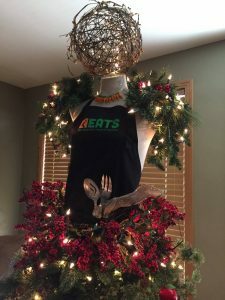 This unique dress-form turned Christmas tree will be the conversation piece in any venue, sparking imagination, smiles and healthy appetites. EATS Park City created “Eatie” to remind us that good food is eaten with forks, not fingers; comes from the oven not the car window and is made with love. Happy Holidays from EATS Park City! The Park City Rotary is pleased to host the first Giving Tree Festival in support of more than 30 local nonprofits. The ticketed-only live auction will include a light dinner and cash bar. Delivery of trees will be arranged with and PROVIDED TO the winning bidders. Let us help you take the stress out of holiday decorating this year, while you find a one-of-a-kind holiday tree, wreath, or menorah. Know that you’ll be giving a gift to your favorite local nonprofit with your winning bid. Join your neighbors and friends in a fun, relaxed atmosphere as the Park City Rotary helps you help the nonprofits that make our community special. To buy tickets and learn more about the festival, click here.